RIO DE JANEIRO, Jun 23 2012 (IPS) - Agroforestry is gaining ground as a tool for climate change adaptation and mitigation in Central America, a region where global warming could generate losses equivalent to 19 percent of gross domestic product. 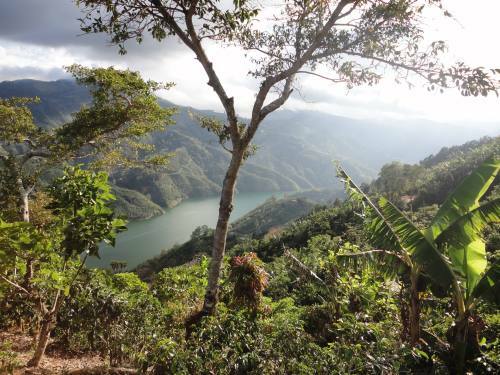 “Agroforestry is our only alternative to mitigate and adapt to climate change,” Alberto Chinchilla, executive director of the Central American Coordinating Association of Indigenous and Peasant Community Agroforestry (ACICAFOC) told Tierramérica. A side event of the United Nations Conference on Sustainable Development (Rio+20), held Jun. 20-22 in Rio de Janeiro, addressed this “climate-smart” agriculture approach that could help reduce the vulnerability of the Central American region. The meeting was attended by government ministers, scientists, technicians and farmers. An agroforestry system combines trees with agricultural production and livestock grazing. Its practice, enhanced by scientific research, can contribute to the development of environmentally friendly methods and technologies, said Chinchilla. For example, trees can help in the recovery of water sources, provide protective shade to crops, conserve moisture, and keep pasture lands cooler, reducing the heat stress suffered by cattle. Agroforestry can also contribute to the recovery of native or endangered tree species while increasing the food security of communities. “Agroforestry links agriculture, food production and trees. We can no longer continue to implement agricultural policies with the Ministry of Agriculture separated from the Ministry of Environment. We must harmonize these policies, and trees must be part of agriculture,” Chinchilla maintained. The effects of climate change are the biggest threats facing Central America, made up by seven countries with a combined population of 43 million inhabitants, almost half of whom live in poverty. Protected areas make up 27.5 percent of the region’s total land area. But it possesses enormous biodiversity, according to Rigoberto Cuéllar, the minister of natural resources and environment of Honduras. Cuéllar fully supports the implementation of agroforestry systems in his country. “Climate change is one of the factors that limit sustainable development in the region. We are actively backing agroforestry and the promotion of productive activities. We need to define clear policies to carry out coordinated actions in our countries,” he said. Central America’s GDP is growing by five percent annually, but it is estimated that the region has lost 1.7 percentage points of GDP in the last two decades due to climate disasters. According to Chinchilla, the practice of agroforestry has expanded considerably over the last decade in the region. The Central American countries could come to represent the vanguard in this approach thanks to a series of projects that promote agroforestry and food security. Over the next four years, some 10 million dollars will be invested in community agroforestry through projects with ACICAFOC partners. The beneficiaries are members of indigenous and peasant farmer communities. Chinchilla said that the challenge is to integrate traditional and scientific knowledge. To that end, ACICAFOC has joined with the Tropical Agricultural Research and Higher Education Center (CATIE) to organize a training program to strengthen traditional and academic knowledge on tropical agroforestry systems. The Tikonel Association for the Development of Production and Services is a prime example of local initiatives around agroforestry products. Executive director Francisco Xanté Lobos said that Tikonel works with 16 rural communities, most of them K’iche’ Maya indigenous communities, who grow tree species like pine and cypress on plantations that have earned green label certification. They also produce coffee, macadamia nuts and cacao alongside these timber species. “After 20 years we realized that we have done many things that contribute to sustainable development. We want to call on governments to do more to promote integrated development as a way of contributing to a better quality of life,” Xanté Lobos told Tierramérica. Costa Rica, for its part, is a model of national efforts to promote reforestation and payment for environmental services. According to Environment Minister René Castro, the country’s forest cover had been reduced to a mere 21 percent of its national territory in 1987, but was increased to close to 52 percent by 2010. “This year we are going to reach 4.8 million trees, one per inhabitant,” announced Castro in his presentation. Reforestation is a national effort, funded by a fuel tax based on the “polluter pays” principle and implemented through a system of payment for environmental services, he explained. An additional program in Costa Rica focuses on reforestation with native and endangered tree species. “Cattle ranchers and farmers who plant endangered species are reimbursed with 50 percent of the cost,” said Castro. It is a simple instrument which demonstrates that it is possible to recover these tree species, he added.